Releasing channel catfish into the river. Photo courtesy of the MWRD. 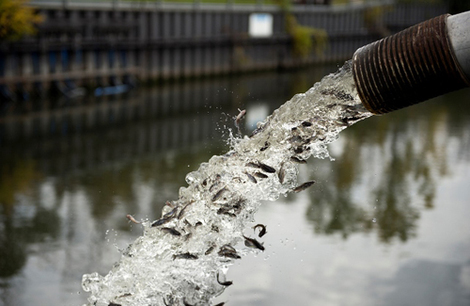 The Chicago River's fish population has survived a multitude of harsh conditions. During pre-European settlement, fish flourished in the slow-moving prairie stream. But as humans began to modify the river in the 1800s and 1900s, fish species were often negatively impacted. Pollution and habitat destruction led to declines in the overall fish population, so that by the 1970s, there were fewer than ten species that lived in the river. Happily, fish numbers have rebounded since those tumultuous times. Improvements in water quality and habitat mean that more fish are now thriving in the Chicago River system. Today, there are more than 70 species of fish in the river. As Friends and other organizations continue to advocate for a cleaner river and engage in restoration projects, we expect fish numbers to continue to rise. Bighead and silver carp, two species commonly grouped together and known as "Asian carp," are introduced species that have invaded much of the Mississippi River basin. The carp are currently NOT in the Chicago River system. 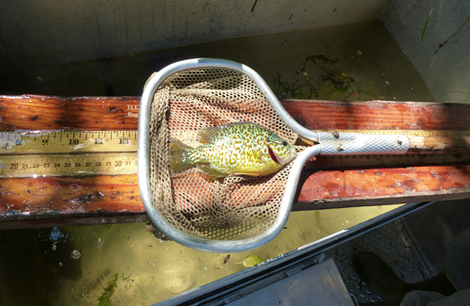 Pumpkinseed sunfish are native and commonly caught in the river. The Illinois Department of Natural Resources has a great guide to many of the fish species we see in the Chicago River and Lake Michigan. Some common species of fish are highlighted below.